Red, yellow, green, blue and every colour inbetween. Can you imagine cakes decorated with all the shades in the rainbow? If you want cakes from the palest pink to the brightest red read on for this month's Colour me pretty selection. We kicked off the month not only in a colourful way but in a gluten free manner as well. Kate's blog, The Gluten Free Alchemist, is dedicated to all things gluten free since her daughter's diagnosis with Coeliac Disease. This month has seen Coeliac Awareness Week with its aim to people realise that some of the health symptoms they could be suffering are in fact Coeliac Disease. 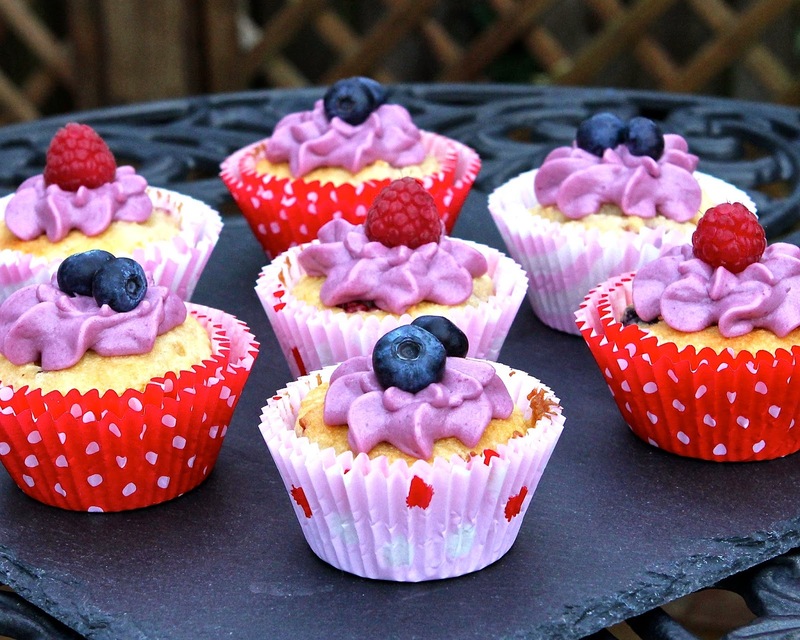 To show how life without gluten isn't dull or tasteless Kate served us up some Raspberry and Blueberry Muffins with Blueberry Frosting. Do you love those boxes of doughnuts with the pretty coloured sprinkles and the chocolate glaze? Would you rather be able to bake a healthier version at home? Of course you would. Now you can with Caroline of Caroline Makes... recipe for Baked Ring Doughnuts. Using a shaped doughnut tin you make up the mixture and less than 10 minutes later in the oven your doughnuts are ready. Brilliant! You may not be able to get Mini Eggs all year round but you can certainly have chocolate cake at any time. 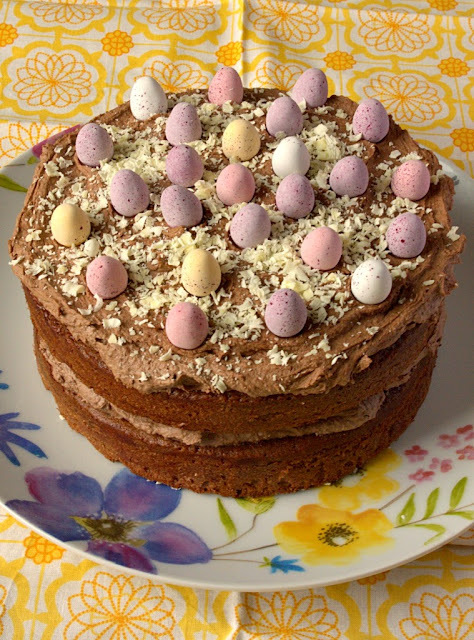 This my theory and also that of student chemist Laura from I'd Much Rather Bake Than and her Malted Chocolate Easter Naked Cake. With two layers of chocolate cake sandwiched and topped with chocolate buttercream this a cake which will make any thoughts of revising a lot more easier. Still not convinced about how good gluten free cakes can be? How about one that is gluten free, flourless, fatless and diary free? 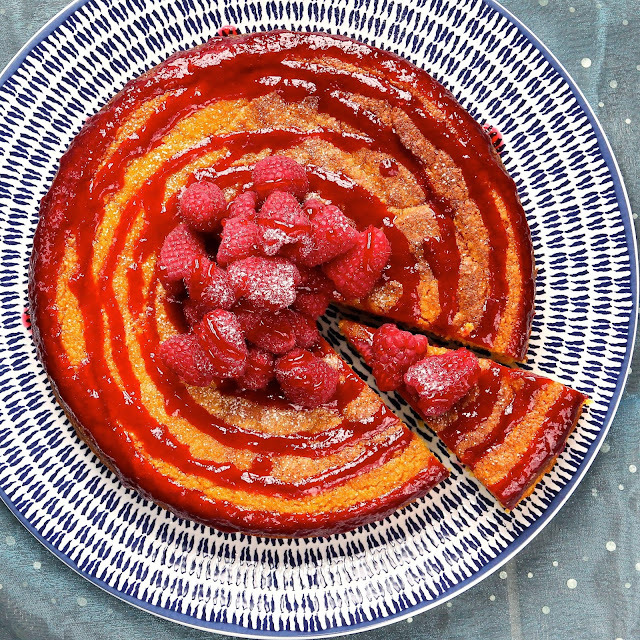 Kate shows us again how it is done with her Flourless Orange Cake with Honeyed Raspberry Coulis. It's made from ground almonds and the puréed orange keeps it moist. A topping of raspberries with honey and maple syrup finishes it off. With rhubarb in season it's time to think of ways of using it. What better way to cook with it than to bake it in a cake. 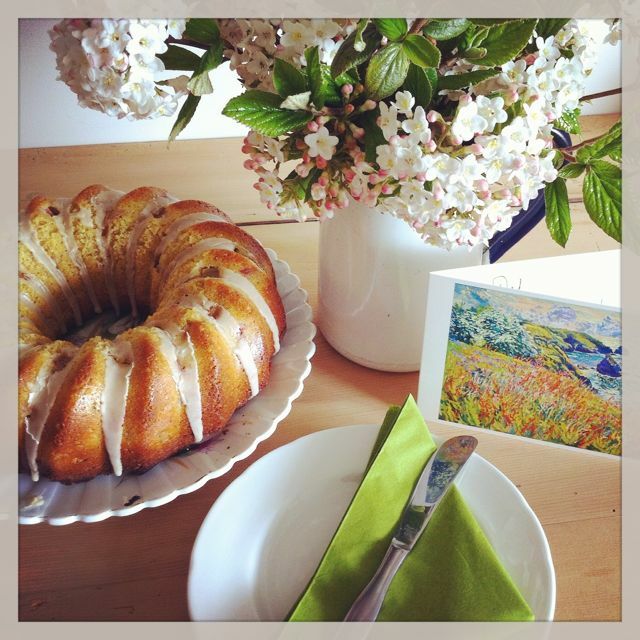 Using some classic flavours to bring out its best Choclette of Tin and Thyme made a Rhubarb Bundt Cake with Ginger Glaze for a friend's birthday. To further enhance the flavour there is also the juice and zest of an orange included. A celebration for a promotion prompted the need for cake for Jen of Jen's Food. 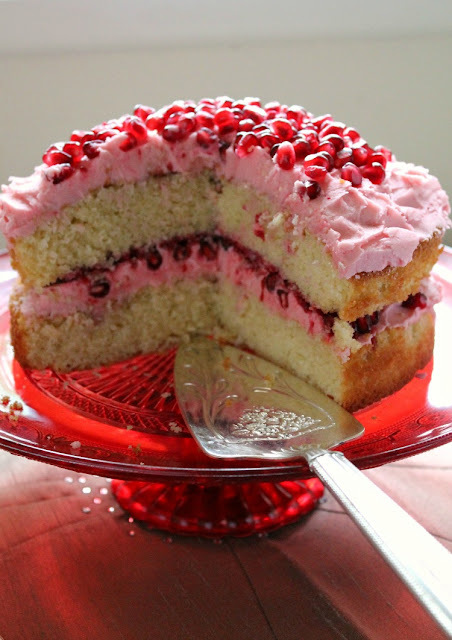 Forget expensive presents when you can have the edible jewels of pomegranate all on top of a cake. Jen baked a Raspberry, rose and pomegranate layer cake for the occasion and the all the lovely colours are natural. How do you make cheesecake gluten free in a simple way – ditch the base of course. This is what Alida of My Little Italian Kitchen did for her Blueberry Ricotta Cheesecake. 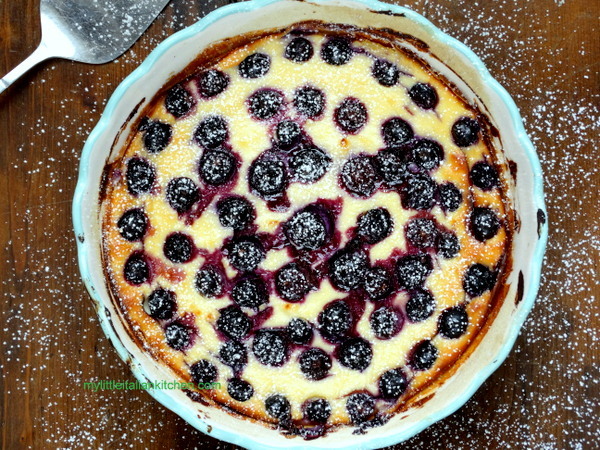 This is baked to make it a perfect make ahead dessert and the blueberries add colour and flavour. It is certainly rhubarb season and if making a large cake is not for you then try out Chardonnay and Samphire's Rhubarb Muffins. This recipe uses maple or agave syrup for the sweetness rather sugar and a range of spices for added flavour. If you want to get natural green colouring for cake making the obvious ingredients to go for are mint and kale. Kale?! Well of course and that's what Johanna of Green Gourmet Giraffe used for her Kale cheesecake surprise choc mint cupcakes for a vegan bakesale. 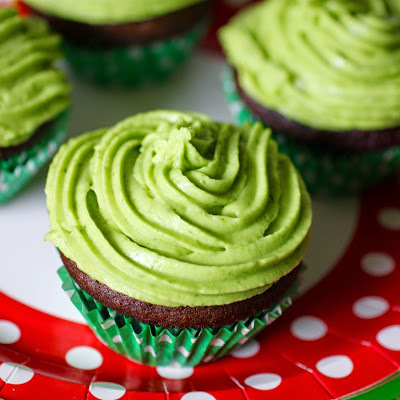 Inside each of the chocolate cupcakes is a bite of kale and mint cheesecake mixture and topped off with a swirl of the same mixture. 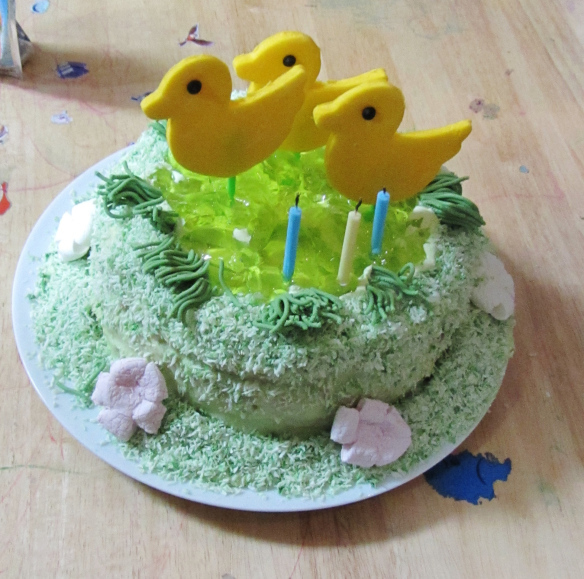 With the need for a Duck cake for her daughter's birthday Corina of Searching for Spice came up with three little ducks plus their own jelly pond. Complete with fondant pond weed and a coconut and cream covering this was the ultimate birthday cake for duck loving three year old. You can get colour from a bottle or a tub or alternatively go for some natural colouring. On this occasion Stuart at Cakey Boi went au naturel for this Blackberry Cake with Lemon Buttercream. The puréed blackberries gives the cake a lovely hint of pink whilst the lemon will have you puckering your lips up. I've seen birdcages as decorations all over the place recently but never as cake. However Caroline has changed this with her Birdcage Birthday Cake. With a base built up of lemon cake it is covered with fondant icing and uses a range of handy cutters and tools to get the decorative touches. Way back at the beginning of the month it was election time in the UK and to counter the madness I launched my Cake Manifesto. It seems my cake policies went down well with the electorate. Let's hope some of ideas are put into action! If you were wondering what type of cupcakes I made they were lemon zest ones – no bland vanilla policies or loopy fruitcakes here. 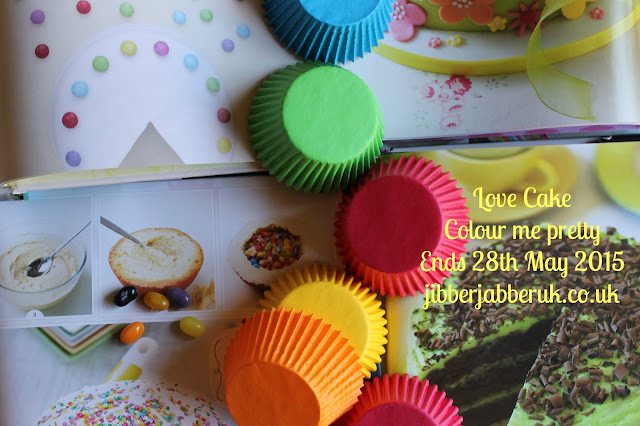 So that concludes what has been a beautiful, crazy but above colourful month for Love Cake. Pop back after the weekend for the big June reveal. Oh wow, so many delicious looking desserts.. Great ideas for baking. Happy Friday, have a great weekend! What a wonderful display! It is like looking at the window of a very good patisserie shop! Wow, so many fantabulous cakes to drool over - which one to try first? Thanks for a great round-up Ness. Fabulously bright and cheerful round up! Can I eat them all please?